Committed to Messiah’s mission of “educating men and women toward maturity of intellect, character and Christian faith in preparation for lives of service, leadership and reconciliation,” the Agapé Center’s Service and Missions Program seeks to involve students in cross-cultural service and ministry experiences with the hope that participants will gain a deeper sense of self and an awareness of God and His work in the world. At Messiah College, we want to challenge students to not only serve out of “love and grace,” but to also reflect and think critically on the service experience in order to gain a mature sense of self. Through service, we hope that students will understand, value and appreciate human differences, which leads to greater cultural competency. In the service-learning model, students participate in an authentic service activity, which meets the goals identified by the community and critically reflect on that activity. As a result of their service experience, students develop a deeper understanding of social injustice and commitment to becoming socially responsible. Service cannot and should not be done alone. The Agapé Center believes deeply in developing and maintaining long-term, reciprocal partnerships in local, national and international contexts. 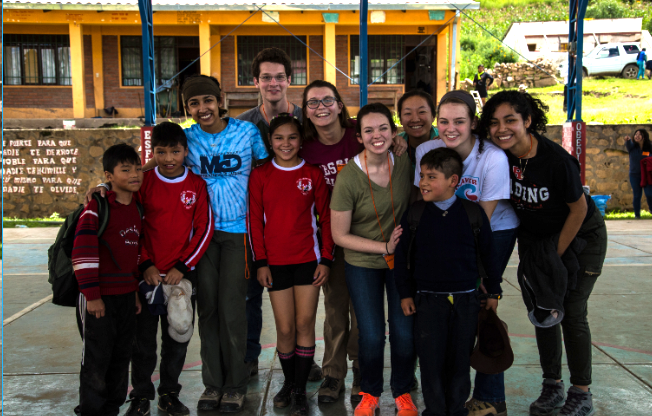 Each year, the Agapé Center sends a team of approximately 14 students and 2 advisors to partner with Food for the Hungry (FH) in ToroToro, Bolivia. FH is a Christian organization, which seeks to end all forms of human poverty. They are moved and inspired by a Christian belief that every person has intrinsic value and it is our responsibility to advocate for the poor and marginalized, without regard to race, creed or nationality. FH empowers the local community leaders to meet the needs within its community, which include a variety of initiatives related to malnutrition, spiritual development, education, and clean water. Our efforts each year are driven by the vision FH has established in the community. For 2018 we have been asked to develop and deliver science education curriculum and resources to equip at least 10 local teachers of the greater ToroToro region. Science education is a critical part of any child’s education. In ToroToro, Bolivia; however, primary and secondary schools do not ordinarily have the scientific equipment or educational resources to provide their students with a hands-on, educational experience in the natural sciences. During previous visits with FH Bolivia, this need has been observed by volunteers and commented upon by FH staff. In March 2017, our team was asked to develop a plan to assist primary and secondary schools in the greater ToroToro region by providing scientific resources, in the form of microscopes and educational plans. First, the schools will be able to educate their students, using hands-on experiences and teaching methods, about the unseen microscopic world. Second, providing microscopes to these schools will enable those entities to serve their larger community by providing beneficial services, such as testing the water supply for contaminants or agricultural runoff. It is our vision, hope and mission that in July 2018, our FH Bolivian team will travel to the greater ToroToro region equipped with microscopes and educational plans to fulfill this need. Teachers will be taught how to maintain and use the microscopes, which will be gifted to the respective schools. Our immediate impact will reach approximately 10 teachers, serving within five schools overall. This project will increase natural science education, while simultaneously providing services to the larger community. We have a team of passionate students who are currently in the process of developing curriculum for our 2018 trip. While our students and staff are diligently planning and fundraising, we are hoping for your support to purchase the 10 microscopes needed to enrich the educational outcomes in Bolivia. Each individual microscope is $250; therefore, we have set a financial goal of $2,500 in order to purchase all 10 microscopes. Any extra funds received will go towards paying the cost of transporting microscopes and supporting stipends for hosting Bolivian educators who will be trained by our 2018 student team in utilizing the scopes. Every penny counts, and we are incredibly grateful for any financial or prayer support. If financial donation is not plausible, please consider supporting our mission by sharing our story – on Twitter, Facebook, LinkedIn, by email, telephone, or on your blog! We’ll be sure to keep you updated along the way – sharing highlights from team trainings, as we prepare for trip departure, and then as often as possible when we are in-country. Upon returning, we would love for you to check-out our student reflections on the blog. Thank you for your support! Check out our blog for a shout out with YOUR name on it! We want to celebrate your role in making this trip possible! Thank you for your support! Look out for an Agapé Center sticker coming your way! Thank you for your support! You’ll be receiving a post-card capturing the highlights of our 2018 service-learning trip to Bolivia!